Sitting up on a slightly higher than the stage balcony behind and to the left of Steve Gadd at the Blue Note in Manhattan was just close enough to perfection. What tone and tones! Spontaneity, flow, articulation, rainbows of pure color from skin, metal and wood drumming all sublime. Allowing the music to unfold, never forcing, never assuming, just breathing prana love and diamond intellect in an ether-like, exquisite, energy-potent mist enveloping Chick Corea, Eddie Gomez and Ben Solomon. 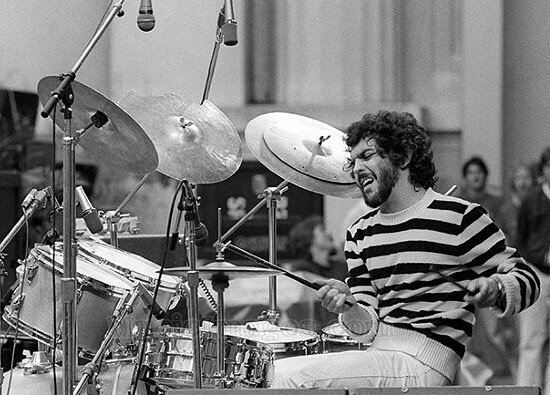 Completely hypnotized by his drumming on the Concierto album with Jim Hall, Paul Desmond, Ron Carter, Chet Baker and Roland Hanna, and the same for Asa with Steely Dan, not to mention the elysian Winelight album with Grover Washington Jr., I had never heard Gadd perform live before. Heading upstairs to the restroom before the set, I ran into him in the hallway, and not really knowing what he looked like, wrongly assumed it was Gomez, as we greeted each other with a handshake, me exclaiming: "Eddie!" Not losing a beat, and without any ruffle at all, he simply replied: "Steve". "Sorry", I said, and we both smiled at the innocent attempt at being friendly. After his resplendent set of music, we ran into each other again, and I asked Steve if he had ever studied the drumming of India. Gadd stated that while he loved listening to it, he felt it was too complicated for him to devote the proper time for actual study. When I mentioned the Concierto album, he enthused: "Yeah, that was a good one"; an assessment that qualifies as one of the greatest understatements I've ever heard. This guy has no pretense, no apparent ego, and no discernible tension other than what he infuses into his art to render the full spectrum of what's possible in music. There were no extra strokes, no unnecessary gestures, just pure elevated creation of the highest order. This is not to slight Chick Corea, who is the greatest jazz innovator chronologically speaking since the late period of John Coltrane, bringing new visions of rhythms, melodic shape, articulations and divine expression. His multifaceted birthday music festival at the Blue Note this fall is a major cultural event not only for New York City, but also the world. Eddie Gomez will always be the great poet of the acoustic bass, captured on treasured recordings with the Bill Evans Trio. This was my first time hearing him live as well. Ben Solomon is an exciting new voice on tenor saxophone, rising to the occasion of playing with three storied giants. In my heart of hearts, I believe percussionists are our quintessential musicians, as witness Steve Gadd on this enchanted evening. Even Indian masters may learn from his playing.